Serge Prokofieff: Suite "The Love for Three Oranges"
Béla Bartók: Suite "The Miraculous Mandarin"
Reference Recordings is kind of like the musical equivalent to Santa Claus, in that you realistically don't know when a nice surprise is going to show up at your door, and you also have no real idea how they did what they did. Hot on the heels of a fabulous Strauss disc with the Pittsburgh Symphony, the label triumphs again with a well-themed, superbly played, and spectacularly recorded disc of 20th Century masterpieces. 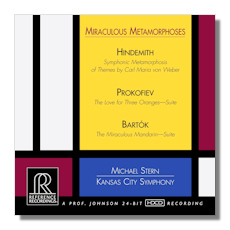 Michael Stern deserves a ton of credit for putting the Kansas City Symphony on the musical map. As the son of Isaac Stern, former conducting assistant to Christoph von Dohnányi, and one time student of Leonard Bernstein, Stern the conductor has near ideal credentials to champion this music. And that's a very good thing; Hindemith in particular has not been treated well recently on disc, so it's great to see an album of such quality on which he features. The Symphonic Metamorphosis features some outstanding playing right from the start. The witty interplay between the winds and strings is exceptional throughout. The warmly assertive brass section also deserves special mention. As for Stern, his confidently brash take on the work pays enormous rewards, especially because he pays such keen attention to detail and orchestral balance. Repeated listening allows appreciation for the not only the virtuosity on display, but also the remarkable amount of contrast dynamically that both Stern's expert direction and Reference Recording's excellent sound allow. The inner sections of the work sound about perfect; those tangy exchanges between sections are just about perfect. If the finale misses some of the sheer polish and panache of Ormandy/Philadelphia on EMI, Stern arguably allows the music to speak more clearly. The Prokofiev is also pretty wonderful. The Kansas City players really dig in to their parts, with plenty of grunts and snarls along the way. Once again, careful attention to dynamics and balances give the work a real sense of tension and excitement. I confess to not especially liking this score much previously, but on a disc such as this, where it's clearly taken seriously and not just as a filler, changes my mind. Listen to the way that Stern builds up the Infernal Dance. Even the short March takes on unusual nobility at a slightly slower tempo. Less bombast and more music sums it up. The Scherzo flies, as does the final Flight. This is great music taken seriously. The Bartók easily outclasses many a version. It's a swift, no-nonsense approach that serves as an ideal showcase for the terrific orchestral players on display. It's not all fast and furious; the various solos are sensitively and expertly handled, but the quicker speeds really do give the work an atmosphere of thrills that's entirely welcome. There's plenty of color, too, and everything from those delicious brass smears to the sleazy strings registers with impact. Stern really keeps things moving, but again, the ability to contrast the various parts of the suite strikes me as most impressive. What these forces may lack in star power, they more than make up for in all-out passion and commitment. Recorded at the new Kauffman Center for the Performing Arts, this new disc deserves a home in the library of anyone who loves 20th Century music.